You’d be hard-pressed to find a food more delicious than pizza, cooking together with friends is the best way to cook, and after that extended winter we’re ready to do all our eating outdoors. 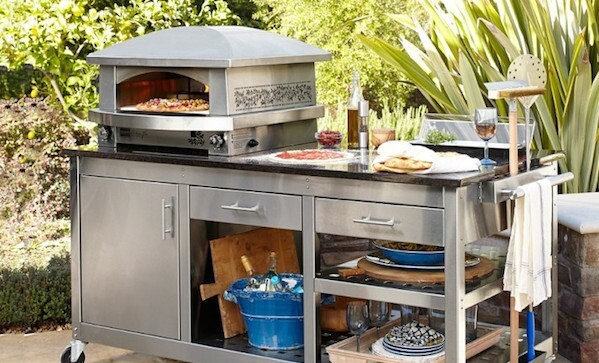 This Kalamazoo outdoor pizza oven ($14,500) from Williams Sonoma speaks to all those needs. Making a pizza is a little more complex than burgers, of course, so this oven is more than an oven. The bottom shelving holds all the accoutrements you need, and your paddles and other long-necked tools have a place right at the side. There’s plenty of counter space to assemble pizzas, and the oven, which is gas powered, has top and bottom burners to ensure the high heat that real pizza demands. Thin-crust pizzas (i.e., the best type of pizza) will cook in fewer than three minutes.